UserChamp helps teams understand their users better. User Research and Support: Do you really know your users? What Types of Data can you get From Support Conversations? What Can Support Do for the Rest of Your Company? Support teams sit on a goldmine of information that can help other teams. Information coming straight from users with all the rich and messy context that brings. But colleagues in other teams are not necessarily aware and will need to be shown how support conversations and support teams can help them achieve their goals. 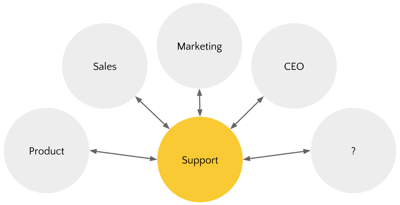 There are a few different ways in which support conversations are unique compared to other types of data about customers. They all add up to offer a set of information about customers that is hard to get to in any other way. An important characteristic of support conversations is that people want to talk to the support team. They may want to talk to you because something is broken or difficult to use, and those aren’t necessarily the happiest conversations. But even those conversations, when handled well, help people solve their problems and make a positive difference. In other cases the conversations may be more customer success or account management like and more consultative in nature. So helping a customer figure out how to get more value out of the tool that we’re providing them with. In all these cases, these are conversations that their customers are interested in having. And should walk away from happier than they came in. Through these conversations a support team has access to a very rich set of information from and about the customer. Approaching these conversations like a user researcher would can be very helpful. User research is all about understanding an audience, and it’s built on the ethnographic approach where you go out and spend time with a particular group of people to see how they live, what they do, and study their culture. That may be a little extreme for what we’re talking about here, but the same principles apply. Through the conversations you have with customers, you actually have an opportunity to get a much broader understanding of what’s going on in their business and what they need the tools you’re supplying to do for them. You have an opportunity to get an understanding of the goals and motivations of your users. And that’s the main main point in terms of thinking like a user researcher, to develop this sort of peripheral vision, where regardless of what sort of interaction you’re having with your customers you’ll occasionally get nuggets of information about what else is going on on their end. There is no better way to build a relationship than to help someone. By just doing their job well a support team builds a unique relationship with customers. A relationship that makes future conversations easier and makes it possible to have the kinds of conversations that provide information about a customer that not survey will ever unearth. Have you talked to your colleagues in sales and marketing about how support conversations can help them achieve their goals? What information is most useful to them? Interested in what support can do for the rest of your company?